Here's a huge treat for our US readers - the line-up for this year's Guitar Center Drum Off has been announced. The show, which seeks to unearth undiscovered drummers, has attracted an all-star cast of judges and performers. Among those putting on performances are Mike Portnoy, Brooks Wackerman, Dennis Chambers, Terry Bozzio, Aaron Spears and Illan Rubin. 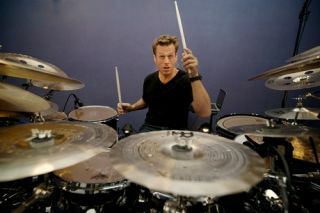 Meanwhile, Tony Royster Jr, Peter Criss, Ray Luzier, Thomas Lang (pictured), Tommy Clufetos, Dave Elitch, Jose Pasillas, Cora Coleman-Dunham and more will be sitting in the judging panel. It all takes place in Los Angeles' Club Nokia on 14 January.